Thanks to Thirsty Camel, would you rather send a snapchat meant for your partner, to your Mum or the coach? Thanks to Thirsty Camel, would you rather be 20 minutes early, or 10 minutes late? Thanks to Thirsty Camel, would you rather go without internet or never fly again? 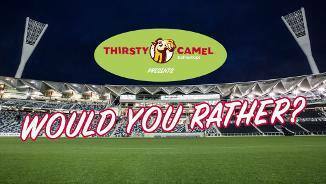 Thanks to Thirsty Camel, would you rather live in a perfect virtual reality world, or the real world? ?